Etude House 0.2 Therapy Air Mask is a hypoallergenic mask, made extra thin so that your skin can breathe while it embraces your skin tighter for better absorption of the active ingredients. 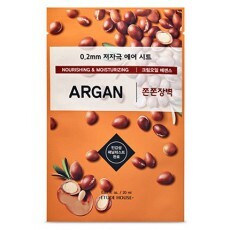 The Argan type (nourishing and moisturizing), is just one of the series of the 0.2 Therapy mask which can be used as a daily sheet mask. After your cleanser and toner, carefully unpack mask and smoothen over face. Let it sit for 10-20 minutes. Pat in remaining essences for better absorption. Follow with your sleeping mask or go to bed as is. For times when your skin feels tired or dehydrated, (or you yourself needs relaxion! ), sheet masks are most convenient way to bring back your skin health in as little as 15 minutes!